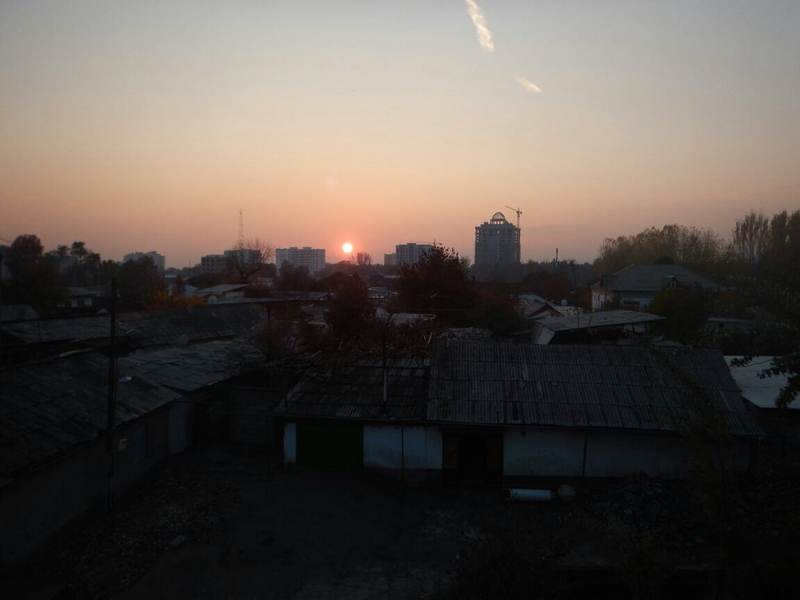 Having spent a very enjoyable couple of days in Bukhara, we were back on our bikes at sunrise again on 15 November for our third and final Uzbek leg: out of Uzbekistan and into Dushanbe, the capital of Tajikistan. 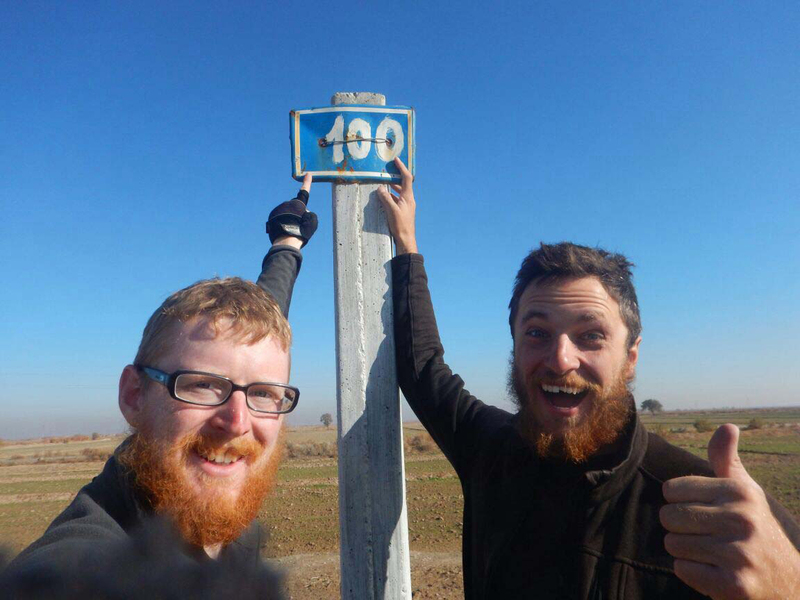 This was going to be our longest crossing – about 600km – but it was much easier to get pumped up for it. 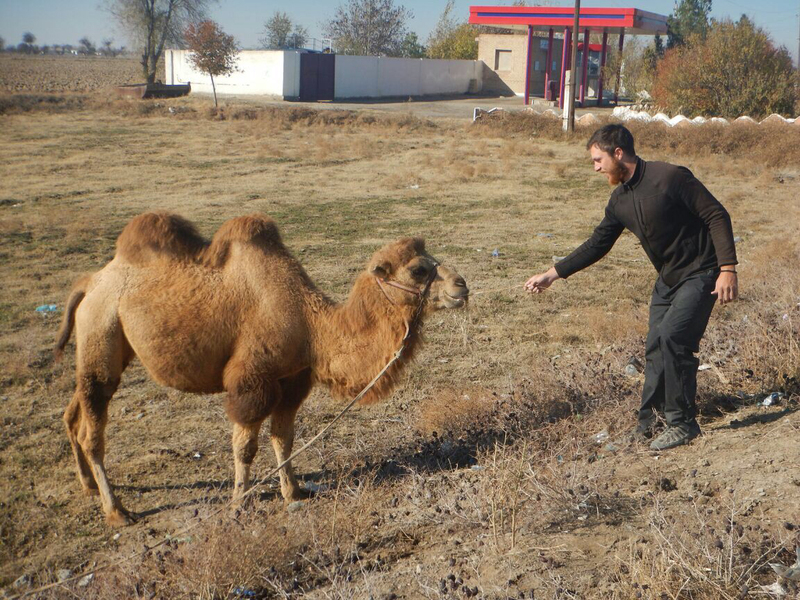 We knew we’d have a proper rest stop in Dushanbe at the end of it, and more importantly, we knew that after a couple of days we would finally be out of the Kyzyl Kum desert and into the mountains separating Uzbekistan from Tajikistan. 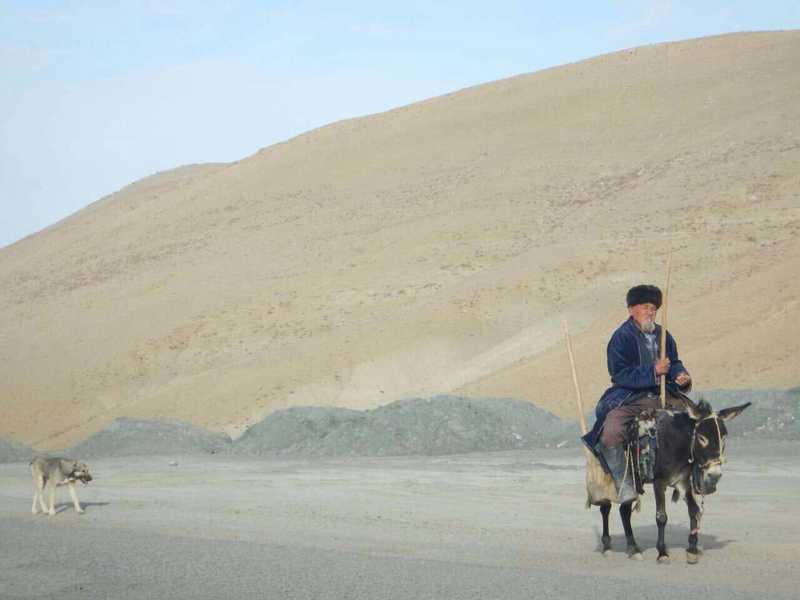 This thought was enough to send us racing away on our saddles across the nearly brand-new road connecting Bukhara to the south of Uzbekistan, and towards Afghanistan. Here we encountered our first Iranian truckers, a very likeable bunch who had presumably come through the route barred to us across Turkmenistan. 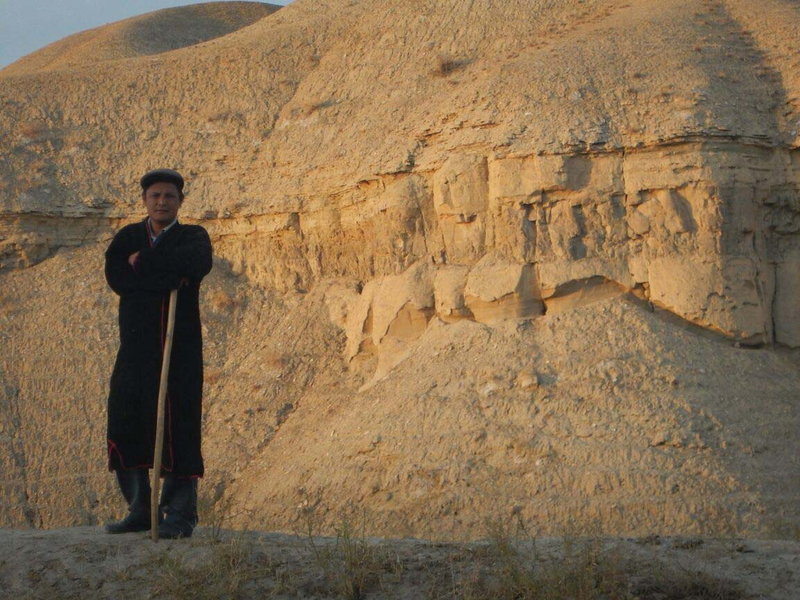 It was fun to see a new nationality join our modern Silk Road, and reminded us that we had rejoined the main trunk road east which leads to China. 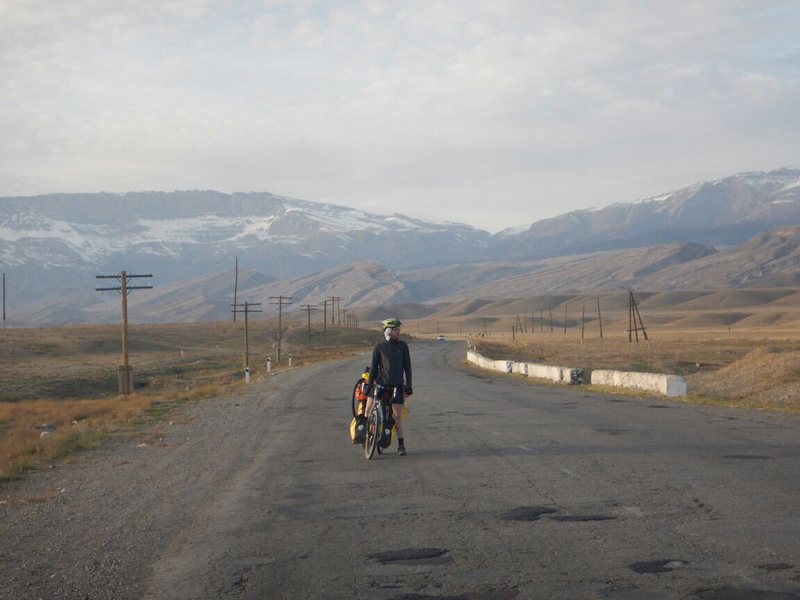 Very soon we will have crossed the length of Uzbekistan by bicycle, completing a challenge which had looked so totally impossible on the approach from Kazakhstan. I can tell you, this was a very good feeling – enough to make the last two hundred kilometres of desert slip past like a victory lap. Only 100 kms of desert left! The wind gods who had tried their best to thwart our passage now conceded defeat, overwhelmed by our good mood, and let us through without so much as a breeze. In fact they even had a word with the sun god, who gave us clear blue skies and a blazing sun as we approached the mountains: suddenly we were down to only fleeces, then thermals, then shorts and T-shirts – in the middle of November. Amazing! 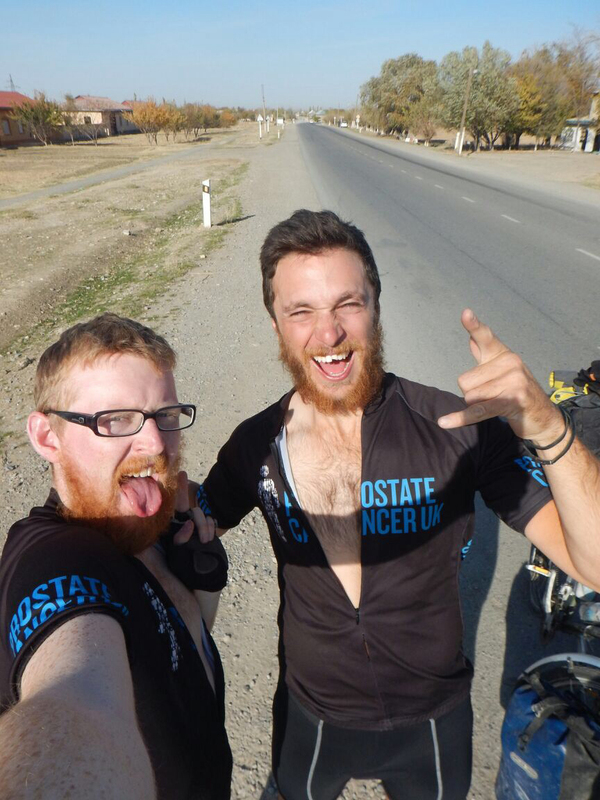 This couldn’t have been a bigger contrast to the grim section we’d pedalled from the Kazakh border, and buoyed our spirits even higher. We flew up the mountain, peaking at 1500m, and down the other side on clean tarmac built by the Chinese. Before the climb we had stopped off at the intersection town of Guzar, where the road splits between continuing to Afghanistan and turning left to Tajikistan. There we caused quite a scene at the morning market when a bloke emerged from his stall brandishing a full vodka bottle, and demanding we finish it together in the name of friendship. It would have been very rude to refuse, though it was still 9 in the morning. A crowd quickly gathered to watch us see off the bottle with our host, everyone extremely impressed at tales of our journey so far. By now it usually just takes a flick of the odometer to our total mileage (at this point hovering around the 8,000km mark) to provoke a gasp, a big double thumbs-up and the offer of a tea stop with a congratulatory slap on the back. 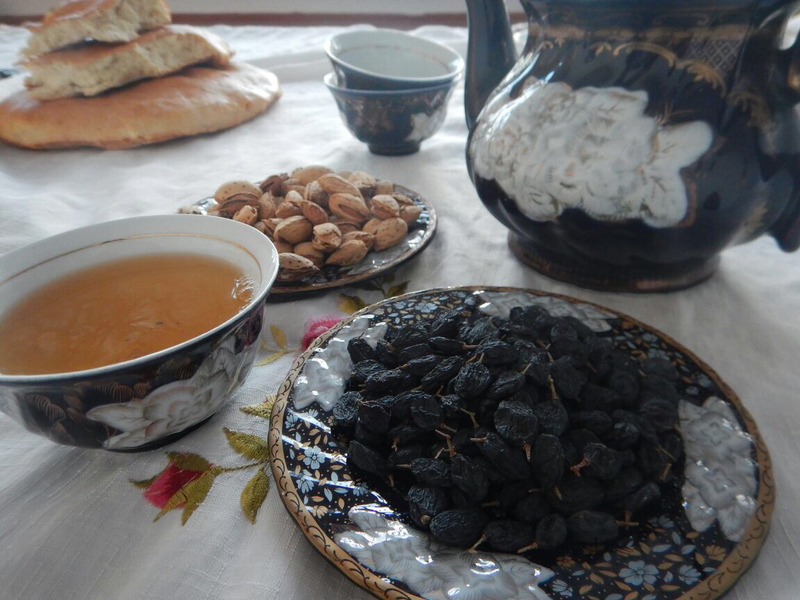 Conversation then somehow moved on to whether we were married, and when the group found out that we weren’t – it was odd not to be married for an Uzbek man of our age – there was an excited chatter about who we should be introduced to from the market. I pictured having to tell extended family that I had eloped with a girl from Guzar in southern Uzbekistan. There was a nice ring to it, but this suggestion signalled it was time to get going, we thought. In style reminiscent of the Georgian cowherder, our bloke passed out and was then carried off by his wife. We were left to zigzag up the mountain feeling extremely merry ourselves! Just before the top we stopped again to drink vodka with a couple of guys on the side of the road, one of them declaring that he would slaughter a lamb in our honour if we chose to stay the night at his place. His timing was a bit unfortunate: on most other days we would have gratefully accepted his offer, but this day we had seen a lamb getting hallaled over lunch, which had plucked a few of our more delicate heartstrings. The deliberately slow way in which it had been done was enough to put you off meat for a while – I’ll leave that one to your imagination. As we continued south beyond the desert the people began to change. The Uzbek men – who had been so totally against our beards from the outset – began to sport little tufts of goatee, the older men growing longer white variations which made them look very wise. More and more people wore long robes, usually purple, a single piece of insulated material like a dressing gown which extended to the knees. Desert had been turning into mountains behind them, and the combination of robe, goatee (often with staff) and moonscape gave everything a Star Wars look!! 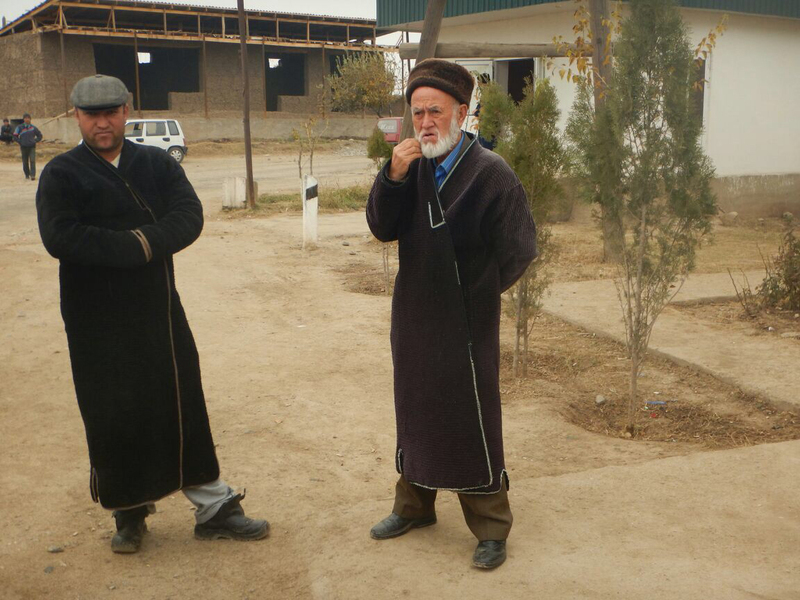 Many older men claimed they were from Afghanistan and the difference in ethnicity was striking. 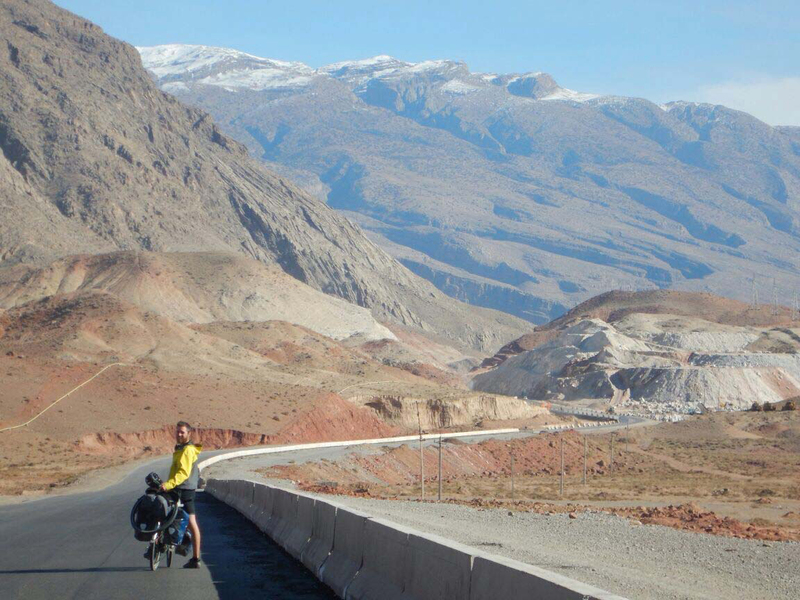 Starting from Istanbul our touring bikes had commanded the centre of attention pretty much wherever we’d gone, and here was no different – except the way people got your attention in southern Uzbekistan was by shrill whistling, from a high pitch down to a low one. Often we would hear these whistles and not see the whistlers until we were well past them, little dots waving frantically at us amongst the fields. 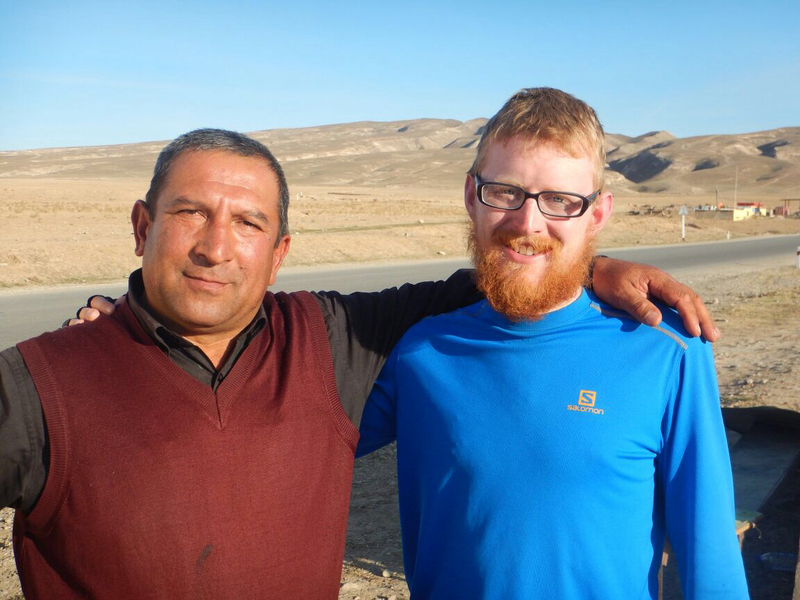 This was a very memorable evening and we were once again struck by the unbelievable kindness and hospitality of complete strangers – certainly a recurring theme for our expedition. It is amazing how readily people have eaten and drunk with us, or invited us into their home having only met us for a matter of minutes. It was also an amazing night’s sleep. This sounds like a mundane detail, but it was a huge contrast with the little rest we got when we overnighted in teahouses. 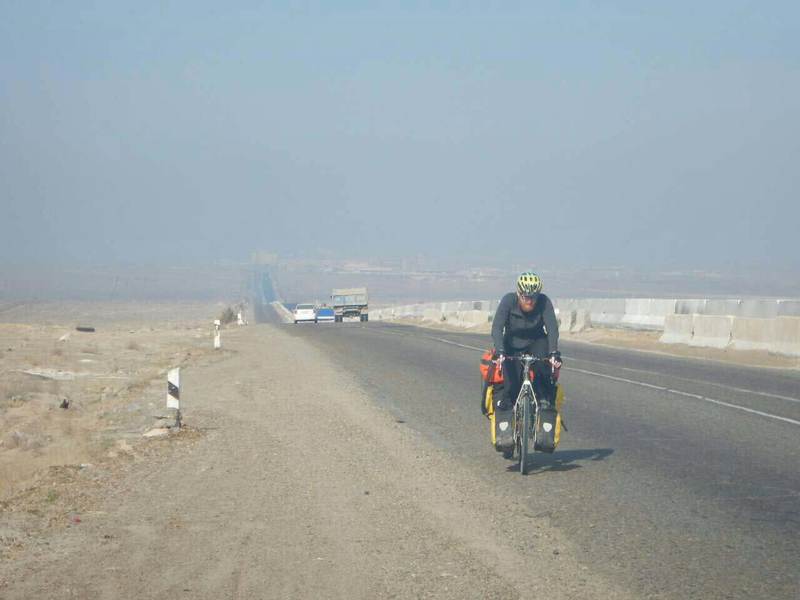 This had made all three passages in Uzbekistan more challenging, as we would be on the bikes all day and then usually wake up feeling like we hadn’t slept. 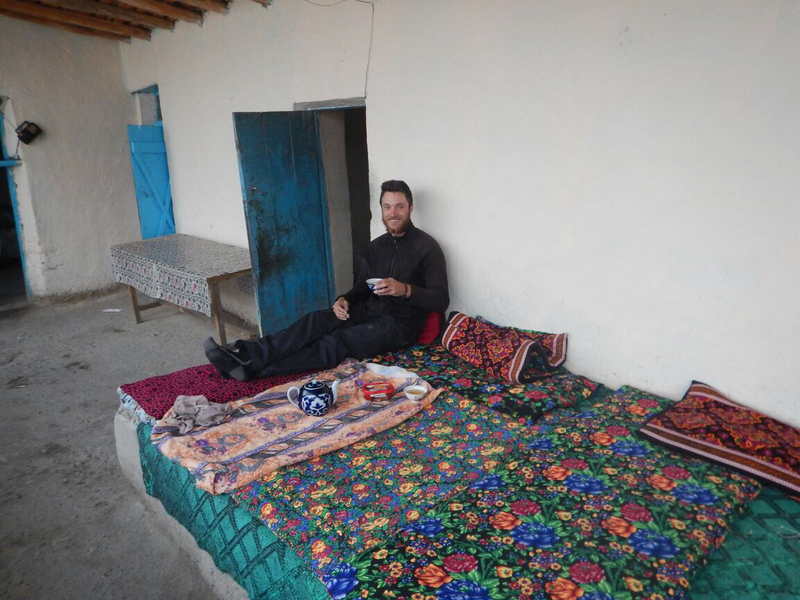 The previous evening, for instance, I had been practically dragged out the door in my sleeping bag by an aggressive Uzbek who thought I was part of the teahouse’s serving staff. Despite the place clearly being dark and closed, he took it upon himself to find a bloke (me) and tell him exactly how many samosas he wanted cooked, at 4am. I told him exactly where he should put his samosas and he stormed off, but that didn’t help me get back to sleep. 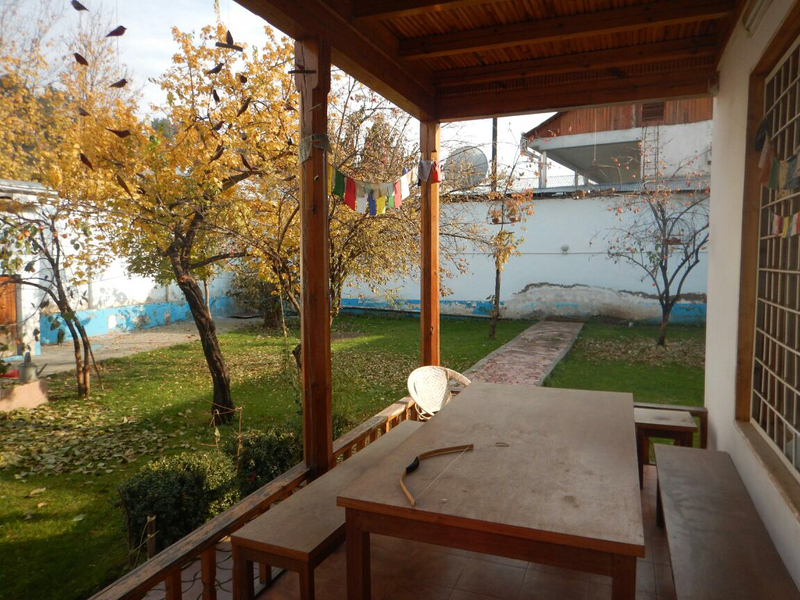 The morning after our Halfway Day – about 160km from the border town with Tajikistan – we woke up to a full breakfast spread, including warm cow’s milk from the next door stable. It turned out that we would need all the energy we could get. By lunchtime we had finished what was left of the climb and were happily freewheeling down the other side, just as the sun dipped behind us in the afternoon. 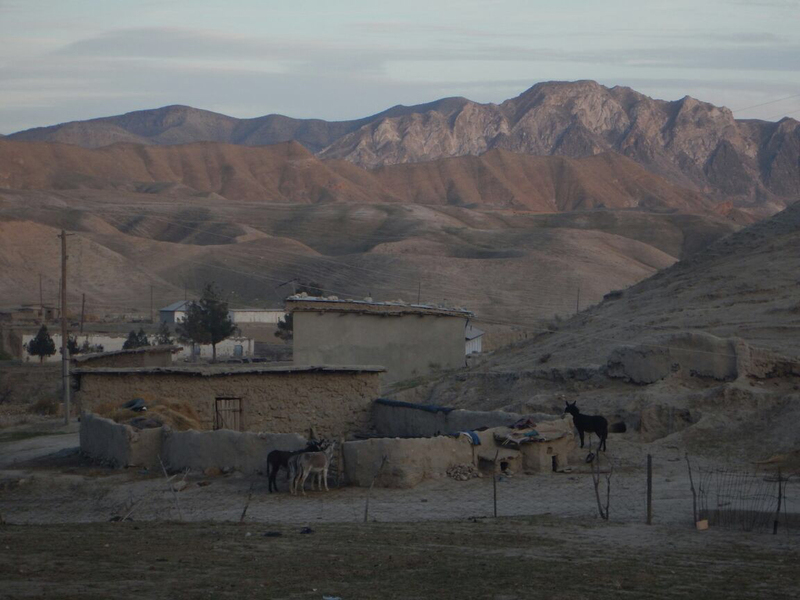 As we crossed yet another military checkpoint we realised we were in trouble: we needed to register that evening and the soldier on duty gleefully informed us there were no hotels at all until the border. 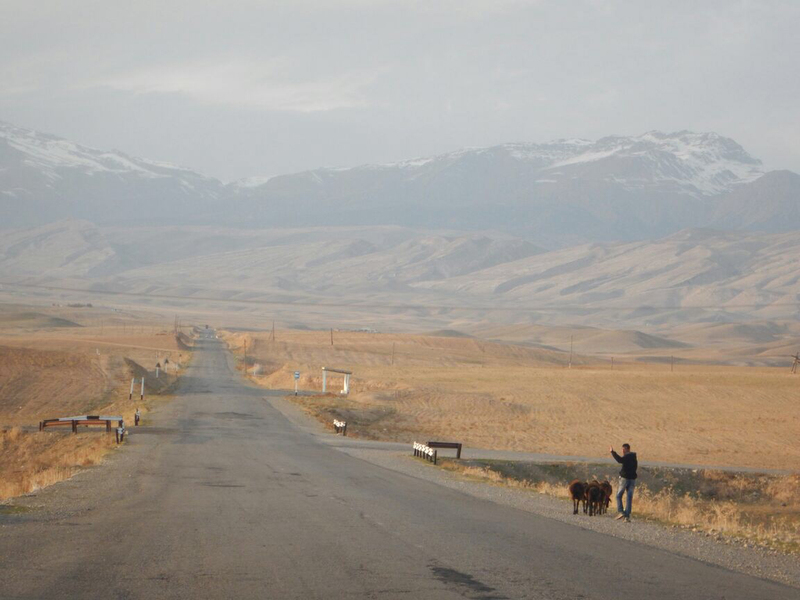 According to Uzbek law tourists are obliged to register every three days whilst in the country. Registration can only happen at hotels and not at police checkpoints despite the frankly ridiculous number of these along the route. The penalty for not registering is an equally ridiculous fine at the border, to the tune of several thousand US dollars. 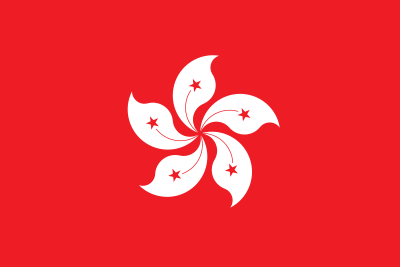 Many tourists have been caught out and raged about it online. Presumably this fine would ‘go away’ if enough cash was presented between handshakes to the right people, but owing to our time constraints to reach Dushanbe this wasn’t an option we were prepared to risk. 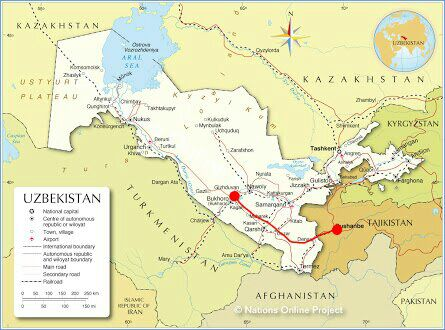 Bribing our way through a border on a bad day could be an excellent opportunity to visit the inside of an Uzbek prison for about a week, which would render our hard desert sprint entirely pointless. We needed to register, and register that evening. I suppose it was quite fitting that we completed the last 60km of our Uzbekistan dash by the light of our headtorches then. 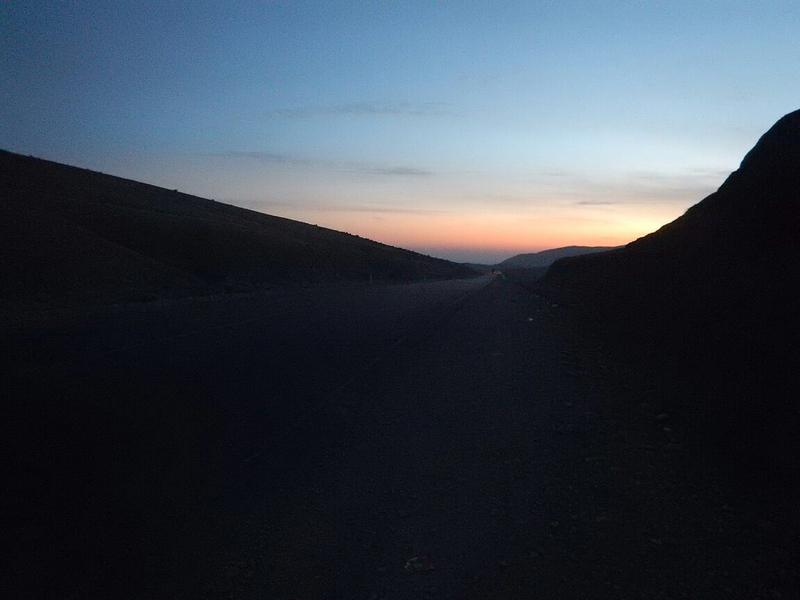 We were firmly in the Green Zone, which made night riding much more taxing than in the desert: we pedalled single-file along roads which suddenly disintegrated completely, getting blinded by full-beam headlights and intermittently chased by wild dogs. This was not fun. Zigzagging around on a potholed road to evade a hound which is snapping at your heels while also being blinded by oncoming trucks (aka death) is not fun at all. We took rest and chocolate stops every 15km to stay sane, which extended our nocturnal ride time to 5 hours. By the time we arrived at midnight we had been on the saddles for 14 hours straight. 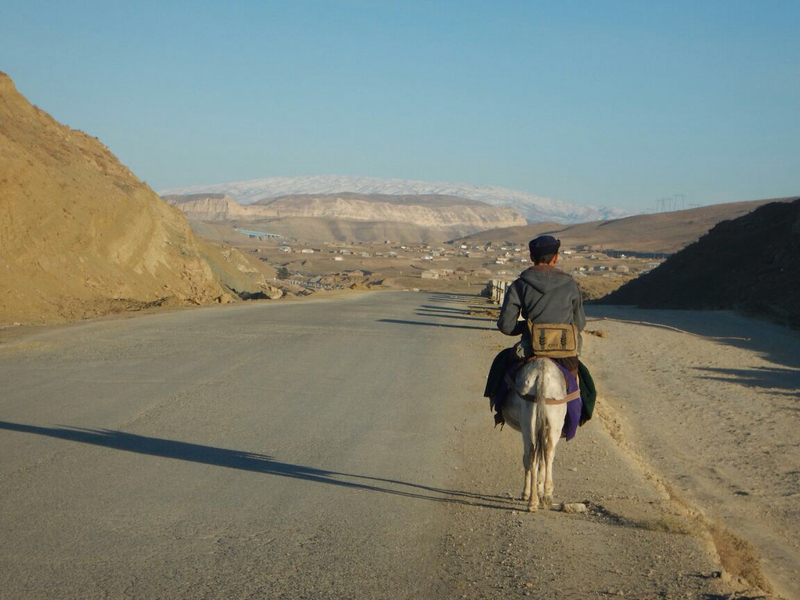 We had crossed 1600km of desert in 14 days’ riding, redefining our physical limits right when they needed stretching – because the next stage of our expedition was to cross the Pamir mountain range. 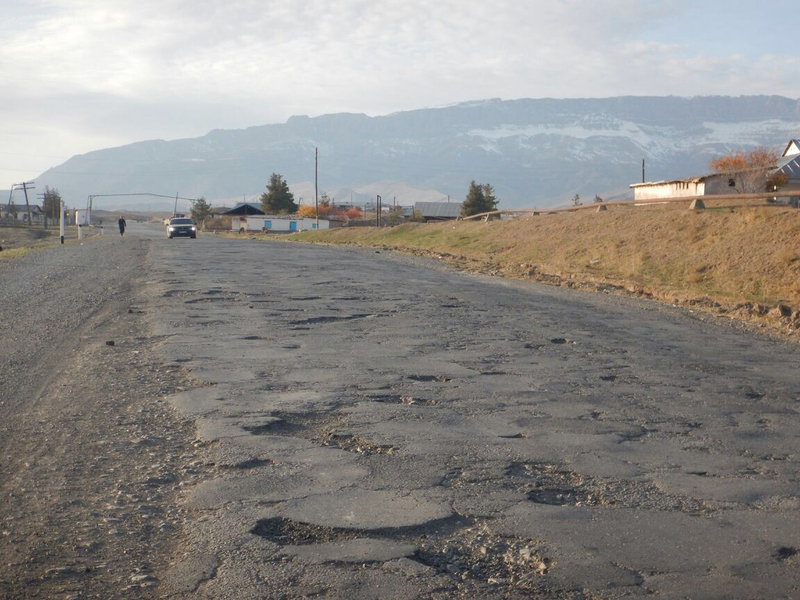 The ride into Dushanbe was very straightforward, on brand-new tarmac again built by the Chinese. 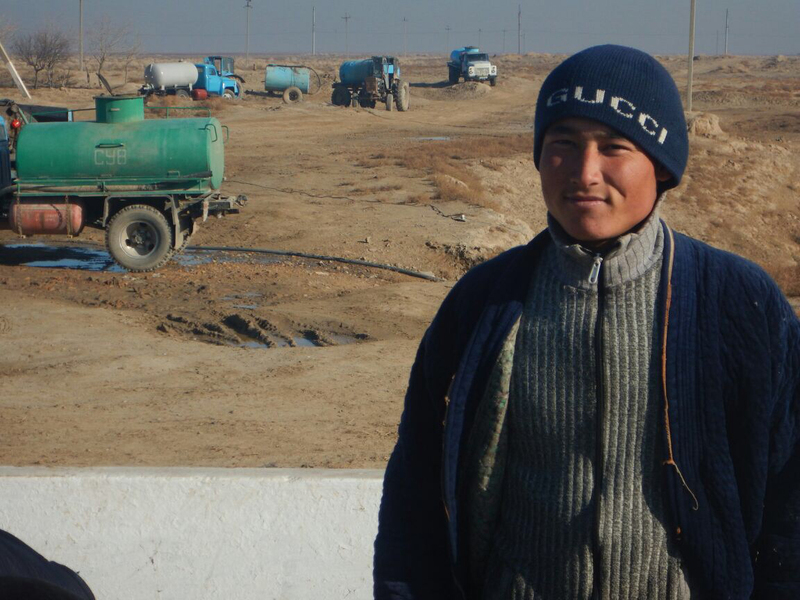 All part of Chinese President Xi Jinping’s plan to rejuvenate the old Silk Road with a $50 billion investment in Central Asian road-building. We did, of course, have to wait a bit at the Uzbek-Tajik border: there was a power cut which meant the border guards’ computers couldn’t be switched on. We sat on the benches in no-man’s land as policemen took it in turns to play with our bikes. 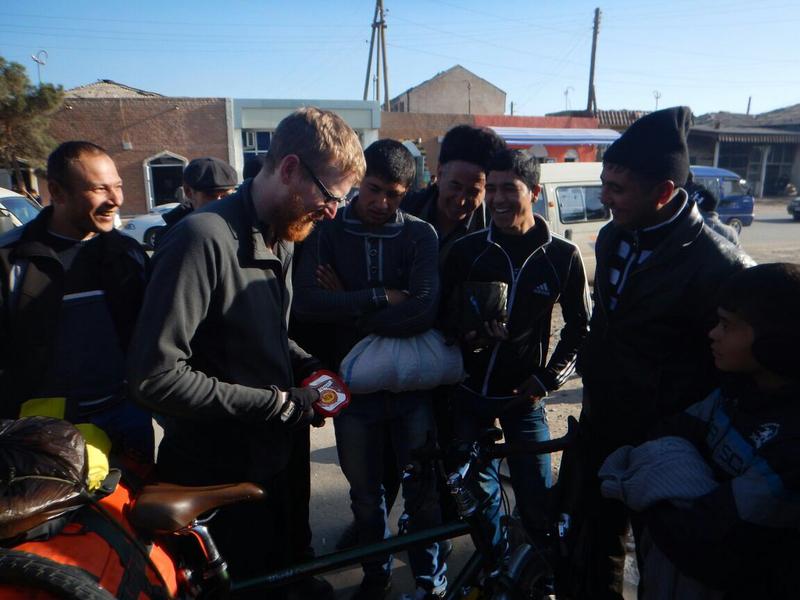 I don’t think I’ve ever seen grown men so excited at the mechanics of a bicycle bell. Three hours later we were allowed through (despite the power remaining off), walked our bikes over to Tajikistan and gleefully got our entry stamps, which signalled the end of our Uzbekistan adventure. It had been tough but extremely rewarding. 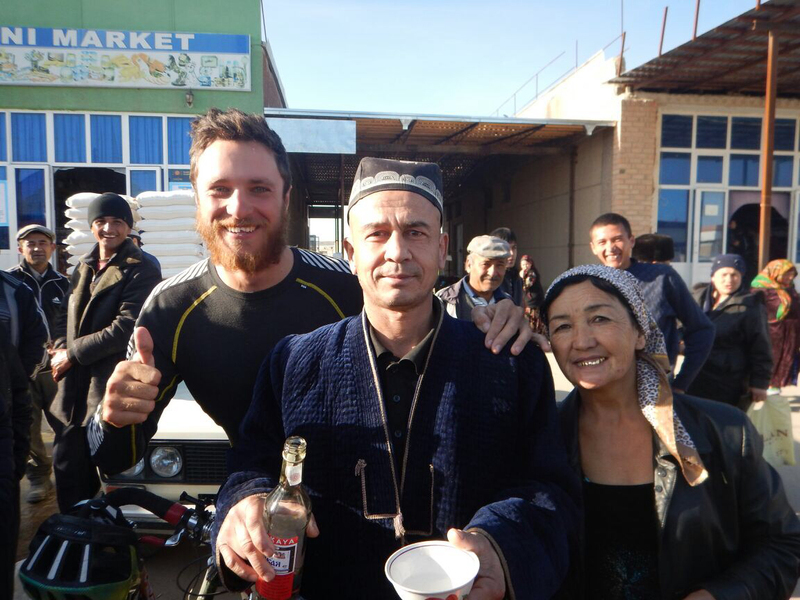 The Tajik customs officials were on their lunch break, so we ducked underneath the barrier and carried on walking. 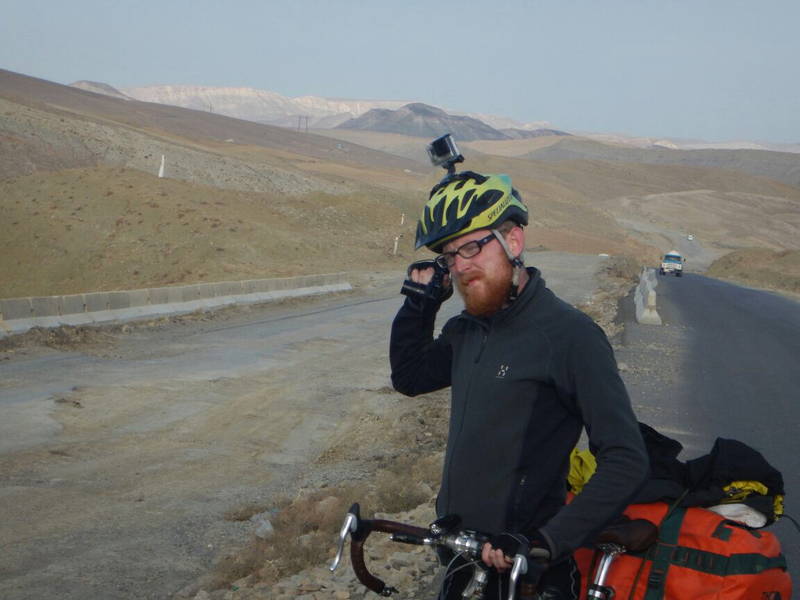 Nobody called us back – so we mounted up, hit the road and were in Dushanbe by nightfall. 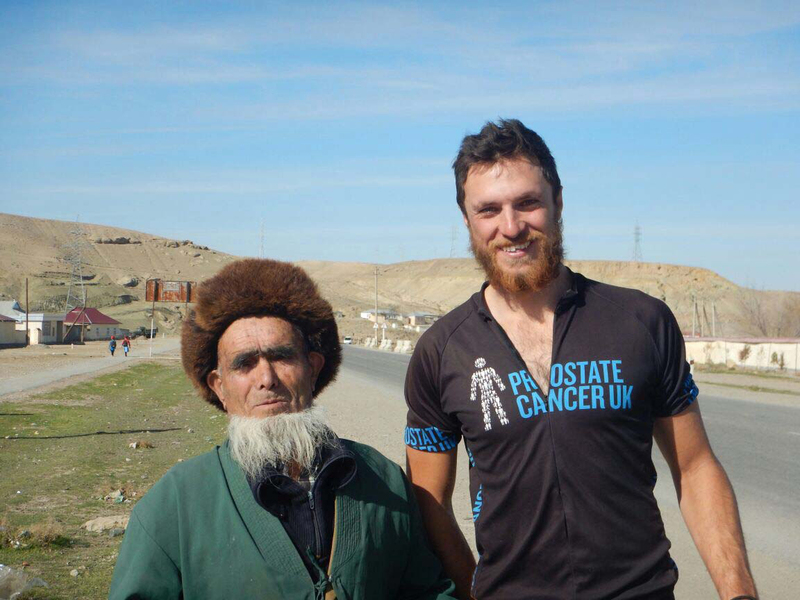 This entry was posted in Uncategorized and tagged Cycle to the East, cycle touring, Dushanbe, Guzar, Kyzyl Kum desert, Laurence Gribble, Nick Codrington, Prostate Cancer UK, Tajikistan, Uzbekistan. Bookmark the permalink.